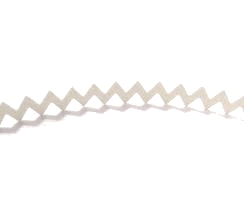 Zig zag turbulator tape made in Germany - available by the meter (choose length via quantity) or per 14 meter roll. 6mm between points, 0.5mm thickness. 60degree angles. 12mm from the leading edge to trailing edge of the tape.